Denise Mazzola is a Certified Professional Dog Trainer-Knowledge Assessed, a professional member of the Association of Pet Dog Trainers (APDT). Denise is a people trainer as much as a dog trainer because every dog has a person or family that loves the dog very deeply. What makes Denise different? Her thorough understanding of the science of behavior sets her apart as well as her empathy for the people and dogs she helps. She holds numerous distinctions and titles in dog training disciplines from AKC Obedience to Rally Obedience. 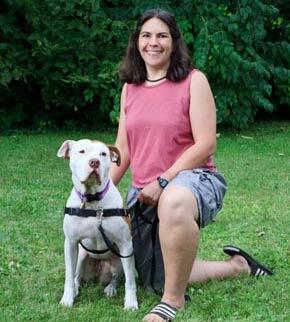 In her over 25 years of working with dogs and people, Denise has seen just about every dog problem possible—both in private practice and in the 10 years she spent as Head Trainer and Director of Business for the Monadnock Humane Society. Puppy issues, house training, all forms of aggression, dog to dog issues, dog to people issues, reactive dogs, dogs that run away. You name it, she’s seen it. An expert dog trainer and highly respected professional in the dog training world, she trains others to be dog trainers and professional dog walkers. She continues to polish her own skills by regularly attending workshops and seminars with the best behaviorists and trainers in the field, including Parveen Farhoody, Bob Bailey, Jean Donaldson, Dr. Ian Dunbar, Brenda Aloff, and Trish King. Denise has been hosting a monthly Ask the Trainer call-in radio show on WKBK1290 for ten years. You can hear her live on the radio the last Monday of each month. Call or email your questions to the studio. She also produced and directed Doggie Dilemmas, a cable-access TV show that airs weekly on Cheshire TV. She writes a monthly column for her business newsletter that is distributed monthly. In addition, Denise originally coordinated the therapy dog visits for the Student Relaxation Day at Keene State College. As the program grew she handed it to the Monadnock Humane Society’s Therapy dog program. When she isn’t working, Denise works out at 6:00 am with Training for Warriors in Keene, hiking, reading and visiting with her adult daughters. Amy Willey has been working with Denise since 2009. 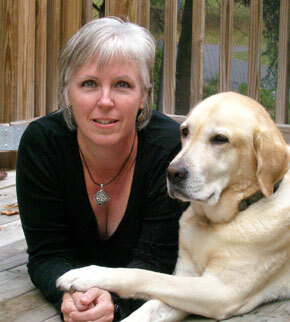 She is a graduate of the Canine Behavior & Training Academy and is a professional dog walker certified through DogTec. At Everything Dog, Amy teaches Puppy K, Basic Manners, Classy Canine and Nose Work classes. She is also a certified Pet Tech Dog First Aid and CPR instructor and she teaches the Growly Dog class for dog reactive dogs. Working with reactive dogs and their owners is a passion of Amy’s. She has very successfully transformed her own reactive dog into a companion that is a joy to take on walks and to classes, and she is eager to share her experience and skills with people who are struggling with their own reactive dogs. Amy recently retired, after 15 years, from the Executive Director position at Brantwood Camp, which serves inner-city teens from urban areas, and joined Everything Dog in a full time capacity in early 2015. Her rare combination of leadership skills, empathy, teaching abilities, and patience give Amy all the makings of a remarkable trainer and teacher. Passionate about helping at-risk youth and adults, Amy also visits after-school programs, Scout groups, local libraries, and the Cheshire County Prison with her therapy dog, Big Mama Jubilee. Amy enjoys training with her dogs through games, tricks and sports. Both, Frankie and Jubilee, have competed in Frisbee sports and they have both earned their APDT Rally Obedience Level 1 titles. Jubilee has not only earned 3 first place ribbons in her first 3 competition Rally runs, but she and Amy have also earned an elusive perfect score together. Most recently, Amy and Jubilee have enjoyed competing in the sport of Nose Work together. They have earned their NW1 Title through the National Association of Canine Scent Work and are training together to achieve their NW2. While Jubilee is busy competing in Rally, Amy and Frankie are out in the woods together hunting for sheds (the antlers that deer and moose shed annually in the late winter). Amy has trained Frankie to find the sheds using both his senses of scent and sight, and when he finds one, he picks it up and retrieves it back to her. Both dogs have an impressive list of performance tricks including the standards; sit pretty, high five, spin, and rollover and a few special ones; hitting an EASY button, jumping through hoops, catching Frisbees, waving, and Jubilee can dunk a basketball. Amy is currently working on training both dogs to discriminate between different objects based on the object’s name. For relaxation, Amy spends time with her dogs, friends, and family, often on long leisurely walks in the woods, taking part in fun dog sports, or reading. She is also an avid hiker and works out at 6:00 am at Training For Warriors. "Our time in Downtown Dog, Classy Canine and Basic Manners classes was so worth it! Thank you!"